Review posted September 12, 2015. Hay House, Carlsbad, California, 2015. 236 pages. 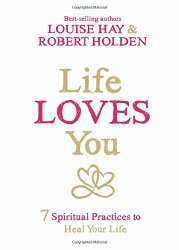 Although this book lists Louise Hay as the first author, the book is written by Robert Holden, and in each chapter he talks about the discussions he had with Louise Hay. But the voice of the book is his, and the book is self-referential, talking about what Louise Hay said he should write about. With that format, the book feels a little lightweight, but that's rather deceptive. The spiritual practices in this book are surprisingly healing. And the format does make it easy to read. I found it uplifting to read a bit each morning, and pause when I got to each of the practices, which they want you to do for seven days to solidify them. 1. Letting life love you. This includes affirmations in the mirror. It feels a little cheesy, but I have to say that it is life-affirming. 2. Affirming your life. In this section, you put up 10 dots around your home to remind you that life loves you. I used post-it hearts, which seem completely appropriate. 3. Following your joy. Here you create an affirmation board of everything you say yes to. You create your affirmation board by listening within. You are listening for your Sacred Yesses. These Sacred Yesses belong to you. They're not your parents' yesses or your partner's, your children's, or anybody else's. They're not about what you should do with your life; they are about following your joy. They affirm what you love, what you believe in, and what you cherish and value. They are about you living your truth. 4. Forgiving the past. Here they present a meditation using "The Forgiveness Scale" that helps you gradually let go and forgive. 5. Being grateful now. This practice is about noticing what you're grateful for. Gratitude brings you back to now. Practicing gratitude helps you to be more present in your life. The more present you are, the less you feel like something is missing. Recently somebody posted this message on my Facebook page: "You may think the grass is greener on the other side, but if you take the time to water your own grass it will be just as green." Practicing gratitude helps you to water your own grass. Gratitude helps you to make the most of everything as it happens. Gratitude teaches you that happiness is always now. I so believe in this practice! These authors aren't the first who've pointed out that gratitude is rooted in the present. 6. Learning to receive. This practice is a step up from gratitude. It's noticing and being open to the ways life is loving you. Receiving is a great big Yes. "The universe says yes to you," says Louise. "It wants you to experience your highest good. When you ask for your highest good, the Universe doesn't say, 'I'll think about it'; it says yes. The universe is always saying yes to your highest good." And you have to say yes, too. The key to receiving is willingness, or readiness. When you declare, "I am ready to receive my highest good in this situation," it shifts your perception and your circumstances. 7. Healing the future. Here the practice involves blessing the world. This involves a meditation that starts with blessing yourself, moves to blessing your loved ones, your neighborhood, your enemies, and finally the world. Maybe some of these practices sound corny. But I am impressed by how positive they all are, and, yes, how healing. Yes, this book is very New Age-y. But as a Christian, I have to agree with everything behind this teaching. I believe that God, behind Life itself, loves me. I believe in following my joy, in being grateful, in forgiving my past. And yes, I want to be ready to receive God's blessings and also ready to turn around and bless the world. This is a wonderfully positive way to live.